The dwarf planet Ceres imaged by the NASA's Dawn spacecraft on Feb. 4, 2015. Credits: NASA/JPL-Caltech/UCLA/MPS/DLR/IDA. The dwarf planet Ceres, the largest body in the asteroid main belt and current target of the NASA Dawn mission, has been the object of a surprising discovery based on measurements made at the Telescopio Nazionale Galileo (TNG). Indeed, a group of astronomers led by Davide Perna from the LESIA – Observatoire de Paris used the DOLoRes and NICS instruments to acquire spectra at different rotational phases of Ceres, and found an unprecedented short-term temporal variability: specific regions of the surface, observed one month apart, present a significant variation in the visible spectral slope. The authors also reanalyzed already published spectra of Ceres’ 3-μm band, and showed that the disagreements in the literature about the shape and interpretation of such spectral feature could be reconciled by assuming that a variable amount of water ice is present on the surface at different epochs. Noteworthy, the presence of surface water ice on Ceres, possibly resupplied from its mantle through fractures in a silicate and ice crust, has been debated at length within the scientific community. The TNG observations were temporally encompassed by the detections of localized and transient sources of water vapor over this dwarf planet (Kuppers et al. 2014, Nature, 505, 525), and let the authors to guess that water ice is indeed present on the surface of Ceres and that its abundance could be variable and concentrated in particular (colder) regions. 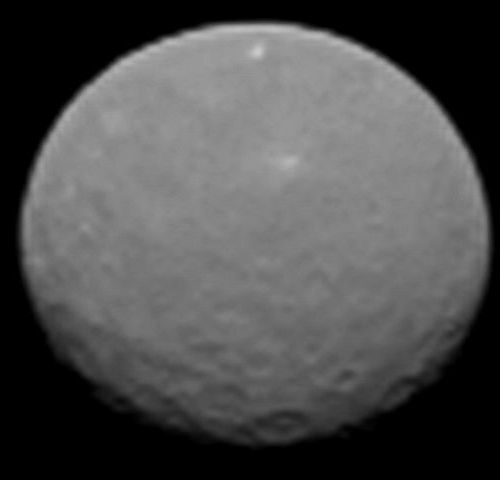 The Dawn spacecraft will enter orbit around Ceres on Friday 6 March, and will hopefully provide key information about the surface variegation and any outgassing activity of this intriguing dwarf planet.